Looking for a cheap EMF Meter that REALLY works well? You found it, the Meterk Electromagnetic Field Detector. If you’ve read any other articles here on EMF Academy, or care about the dangers of EMF radiation, you know that it is all around us. From the cell phone in your pocket to the router in your home, even the cell towers in your neighborhood, EMF radiation floods in from every direction. Some people have what is called electromagnetic hypersensitivity (EHS), and are very sensitive to this radiation and will have noticeable symptoms. However, just because you don’t feel anything, does not mean this radiation isn’t harming you. This is one of the most important reasons you should consider getting an EMF meter, to know how much radiation is around you, and how much is emitted from the devices in your home. There is a wide range of quality EMF meters available, and I usually recommend the Trifield TF2 (read my review). However, both of these are fairly expensive, so I wanted to find the ABSOLUTE best EMF meter that is cheap, but effective. I found it, and it’s the Meterk Electromagnetic Field Detector that you can pick up on Amazon. Now, let’s dive into the meter and talk about why I think it is the absolute best low-cost EMF meter on the market, then we’ll dive into the features and specs. 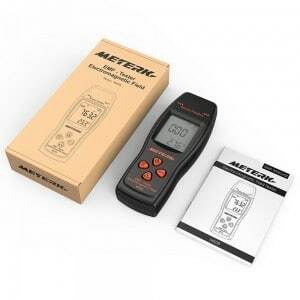 Although it’s fairly new to the market, the Meterk EMF meter brings all of the quality, convenience, and options of a more expensive counterpart like theTrifield TF2. 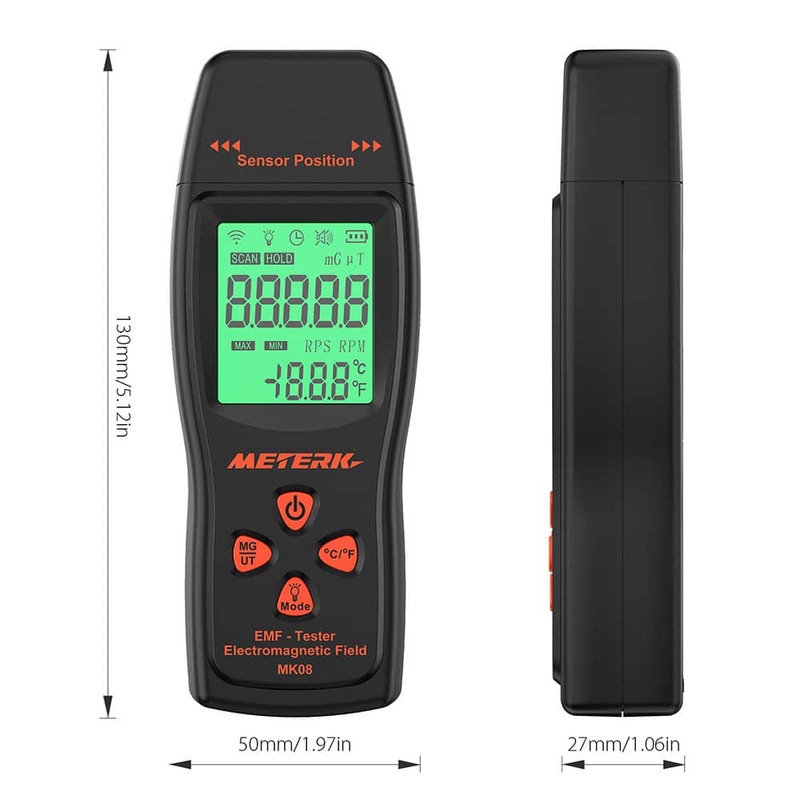 Although the Meterk only measures Electric fields and magnetic fields, these two frequency ranges will provide just about everything you need to measure EMF radiation in your environment. 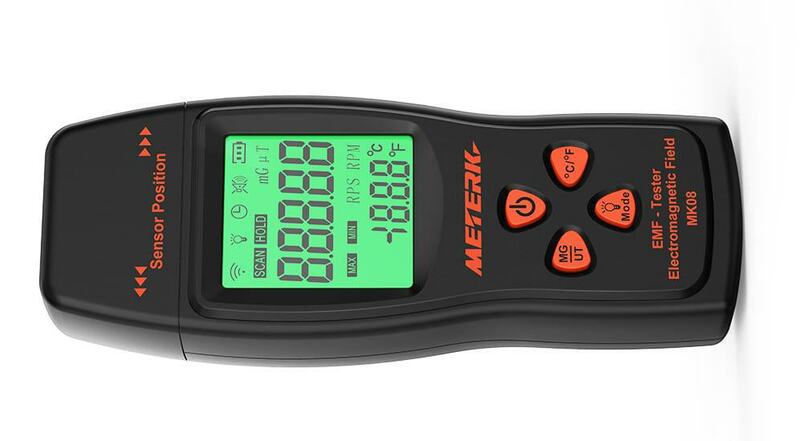 The Meterk is extremely simple to use, displays common EMF units of measurement, and has a fantastic display. It also seems to be just about as accurate as more expensive EMF meter’s when I did a comparison side by side. They call this disabling of the sound the “mutation function” but it’s really handy to have. In iitsdefault state, the Meterk makes an alarm sound when radiation reaches certain levels. Luckily you can just give the power button a short press to disable this sound. This is nice if you’re using the meter somewhere that is public, or if the sound just annoys you (I turned it off). Short Press to select which units you want readings in, either Mili Gauss or Micro Tesla. Tip: I found this part to be a bit confusing, but when you’re setting the safe values with the long press of this button, you use the “Mode” button to go up, and the ℃/℉ button to go down. Which seems a bit odd, but hey, it cant be perfect. Long press this button to turn the backlight on and off, I just leave it on most of the time, it still works great in sunlight. Clarification: So this is a nice function that I really wish more EMF meters had available. When you’re taking a reading of something producing EMF’s, say your Smart meter, the numbers are going to bounce around very quickly, as it’s usually not a static amount of radiation. If you just press the mode button once, it’ll freeze the measurement on the screen for you. If you double tap the mode button, it’ll display the highest measurement it read during that session. Clarification: Long pressing the temperature button will turn off the automatic shutoff. The meterk meter is set to turn off by itself if it hasn’t been used in the last 10 minutes. This is a nice feature to save battery life. However, if you wanted the EMF meter to read the maximum output of something over a long period of time, you may want to turn this feature off. Most of the time when you’re measuring EMF radiation, I would start by measuring it in milligauss (mG), so if it’s not already set to this, go ahead and short press the mG/uT button. Now, the lower the mG the better, in fact the Environmental Protection Agency recommends that you limit your exposure to 0.5 mG to 2.5 mG. Hold the device steady, and if the numbers are jumping around too much, feel free to short press the mode button to freeze the reading. You can use this to measure all types of devices around your home, including the ambient EMF radiation coming from local cell towers and other exposure sources. 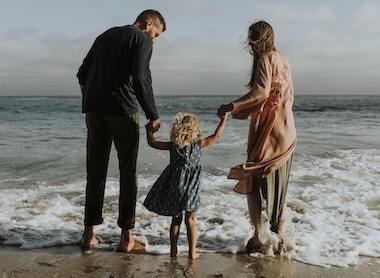 One of the most helpful things about having an EMF detector like this one, is that you can actually implement positive changes in your home, and know that they are making a difference. Most of the articles here on EMF Academy recommend getting an EMF meter, because without one it is hard to know how much, or what kind, of radiation devices in your home are emitting. It is also very hard to know if what you are doing is making a difference. For example, my huge post on Smart Meters recommends a smart meter because you need one to test how much radiation the meter emit’s when transmitting. If you buy a smart meter shield, or get EMF paint, etc. you need to know that it is actually working. 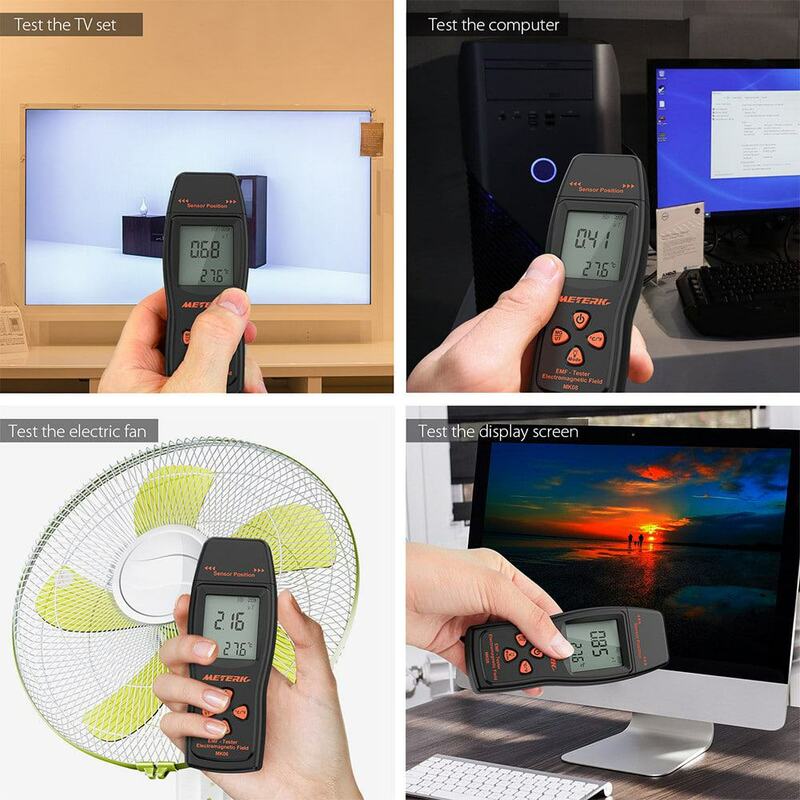 I think no matter who you are, if you care about the dangers of EMF radiation, one of the first things you need to get is a quality EMF meter. Now, there ARE better meters available on the market, but most of them are several hundred dollars. 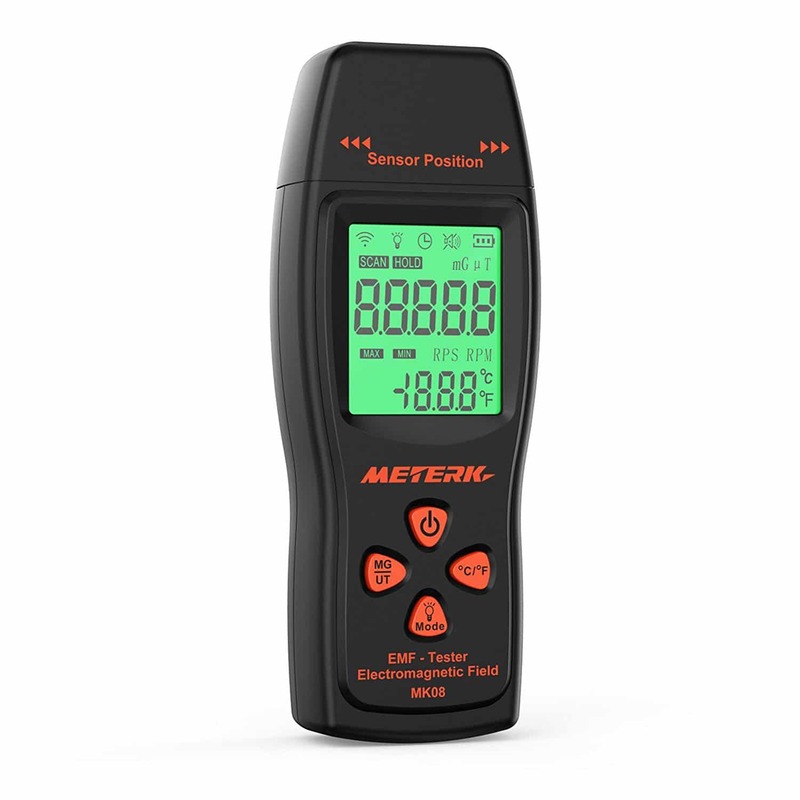 For the money (check current price here), the Meterk EMF meter is the absolute best in my opinion. Not only does it offer most of the features and conveniences of much more expensive detectors, but it has nearly the same accuracy. I added this meter to my EMF toolkit because I wanted to see how it compared, and I absolutely do not regret purchasing it. I hope you enjoyed my article on The Best Cheap EMF Detector On The Market, if you did please consider sharing it.